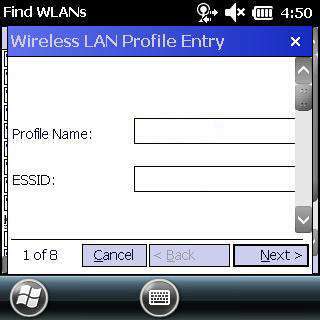 This instructional is to used to set up a WIFI profile on the Windows Mobile Handheld device. 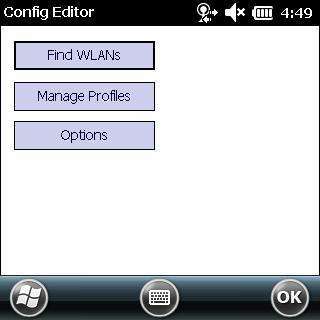 To set up WIFI on the mobile devices complete the following steps. 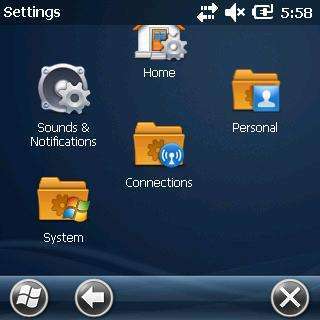 1) Click the Windows icon in the bottom left corner of the screen. 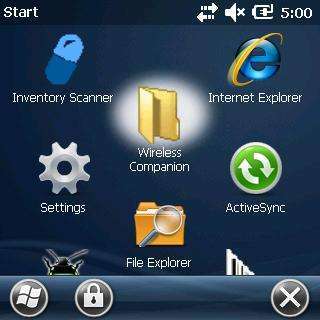 5) After scanner has scanned WIFI Networks you should see your WIFI Network listed. If not, please check your WIFI to ensure that broadcasting is turned on. 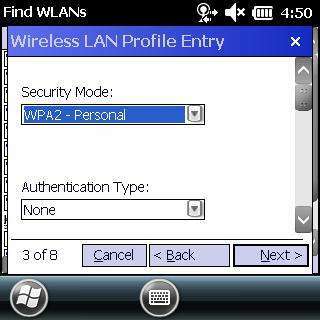 With the pen from the bottom of your scanner, long press on your WIFI then select Create Profile. If the create profile is grayed out, click outside of the box and try again. 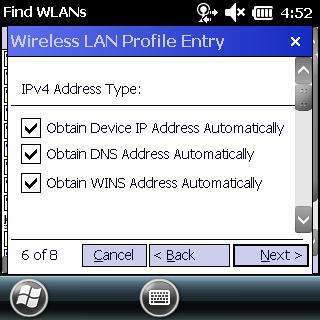 6) Once the WIFI profile creator screen shows set the following settings. Once you have verified your WIFI name click next. 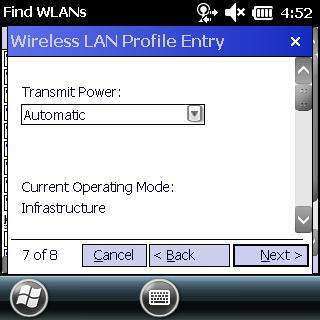 7) Set your Operating Mode to Infrastructure if not already set. Set the Country to "Allow Any Country" and click the Next button. 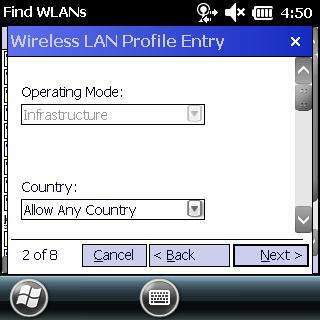 8) Set the Security Mode to the security settings of your WIFI. 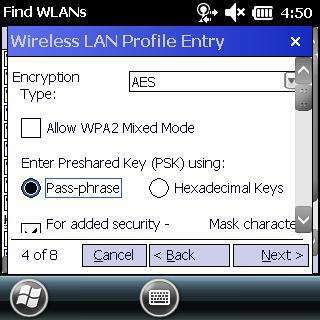 9) Set the Encryption Type to TKIP and uncheck the "Allow WPA2 Mixed Mode". Your Wifi must be set to TKIP mode not mixed. 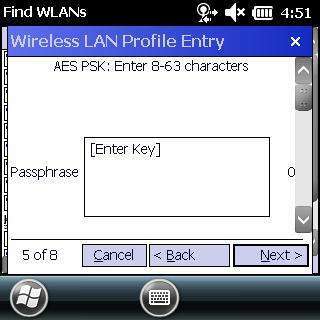 Select Passphrase under the setting "Enter Preshared Key (PSK) using:"
10) Enter the password for your WIFI and click the Next button. There is a keyboard icon in the middle of the screen that will allow you to enter special characters. The keyboard is the standard QWERTY keyboard including symbols. 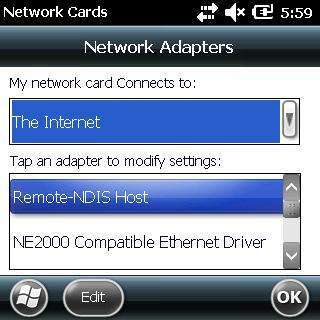 11) Make sure all checkboxes on the IPv4 Address Type are checked and click the Next button. 12) Set the transmit Power to Automatic and click the Next button. 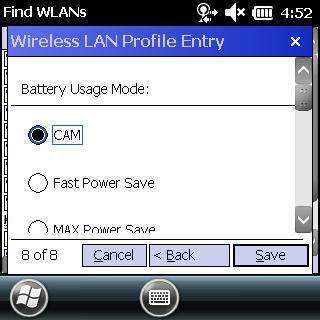 13) Select CAM under battery Usage Mode and click the Save button to complete the WIFI setup. This will prevent the scanner from losing WIFI when it goes to sleep. 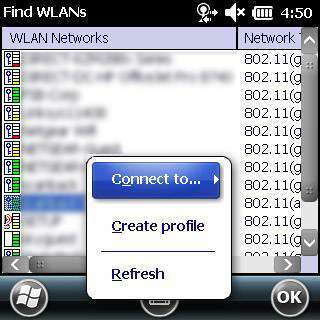 Once you have completed the WIFI setup you will see your profile setup. At the top of the screen will be an antenna icon with two arrows pointing different directions. These arrows should remain steady and not be moving. If they are moving then it is trying to connect. 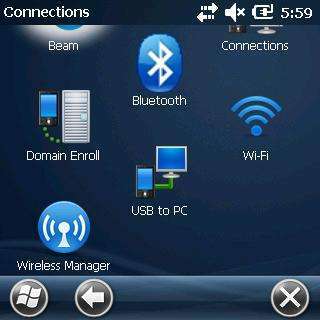 To test your internet connection press the windows key in the bottom left corner and go to Internet Explorer. 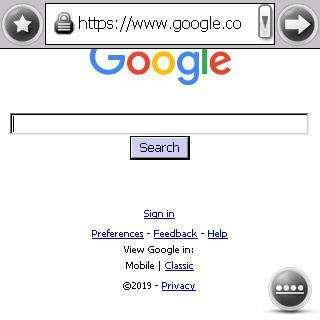 In the address bar type www.google.com. If it prompts you to confirm a security certificate select Yes. Once google.com loads you have verified that you are connected to the Internet. 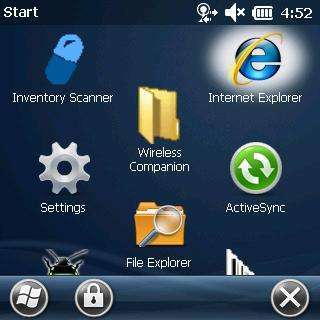 Q: When I am scanning for my WIFI network I do not see it but I can see it on my phone. A: Your WIFI may be broadcasting in 5G. 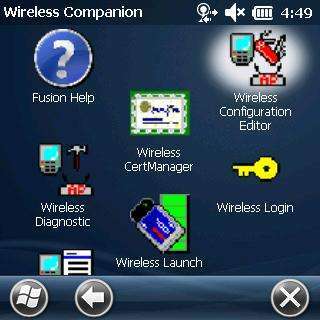 To enable 5G, go to Wireless Companion -> Wireless Configuration Editor -> Options and select Band Selection from the drop-down. 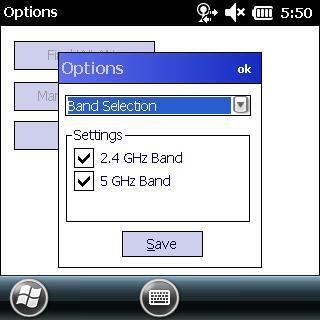 Then check the box under Settings for 5 GHz Band. Q: When I try to connect to the Internet with Internet Explorer it tells me that it cannot connect and to check my settings. A: This commonly occurs because your WIFI settings are set to connect to work. To change this go to Settings -> Connections -> WIFI and make sure that the "My network card connects to:" is set to The Internet.